Join us as we read and discuss Shadowshaper. My (@thebrainlair) comments are in blue and Maria's (@mariaselke, Maria's Melange) are in purple. Saturday, August 8th - pgs. 141 - end. First Half Discussion - I decided to look mostly at the characters in this first half. These are the things that stuck out for me as I was reading. Love Older’s description of his main character - her wild fro, combat boots, and sense of style. Sierra’s style extends to her murals, which I wish I could see. I can picture the huge, shiny dragon climbing the side of the Tower. Sierra alternates between knowing who she is and questioning how others see her. I identify strongly with Sierra. Even though we are culturally different. Even though her artistic skills are something I will never have. There’s something about her struggle to become herself that rings true to my own memories of adolescence. What to think? On the one hand, he appears to be new to the scene, “..who had shown up midyear” (9) and introduced himself to Sierra at the party but later her brother, who’s always traveling, says he always thought Robbie was weird and Robbie himself mentions working with Papa Acevedo since he was twelve. He knows about the Shadowshapers but disappears twice when Sierra needs him. Is that significant or a red herring? Hmm are they friends or enemies? Wick’s notes states he loves the power of the culture behind the shadowshapers but he also seems to want to help by getting Lucera to return. Something profound has happened to Lazaro and his moments of lucidity hold powerful clues. I expected Sierra to pay more attention to him. I have my doubts about Wick’s power because that seems too easy but I will wait to discuss them after the second half so I don’t spoil much. What really happened between Lazaro and Lucera? How does one have a disagreement with a spirit? The bits with Wick toward the end of this section were the exact spot when my interest in the overall storyline became to intensify. I liked the characters from the start - but trying to figure out what’s going on with Wick and the creepy shadows makes me want to dive back into the book and find out what happens next. I’m also getting more suspicious about Abuelo’s health problems. I’m wondering now if it wasn’t entirely natural..
I’m just going to leave that right there for now. Yes! The fact that the rest of the family clearly has information that they aren’t sharing with Sierra is intriguing. What, exactly, are they hiding? I will admit to being a bit angry with the family once I realized that BOTH of her brothers had information and NO ONE told Sierra anything. I was also quite amused with Neville’s antics in getting her into the library. I liked how he was willing to play off of the assumptions people make of him. People want to assume he’s a danger? Fine… he’ll use that. But just how dangerous is he really? The magic is interesting. Throughout this first half, Robbie and Sierra seem to attract random shadows but Robbie mentioned using specific ones for murals. I wonder how he called them? The name Sorrows doesn’t seem Golden to me. Agreed! That difference in terminology (Golden vs. Sorrows) is so odd. What, exactly, is going on here? Is Wick combining the spirits from different cultures? It sounded like his “Sorrows” were from a research trip that was earlier than the one he did in this city. When I first read this part, I was confused and I felt the story was jumbled but going back to re-read, I was able to pick up so much more. I was able to get more into the story and can’t wait to read the second half as I have many questions about Shadowshaping and Robbie and how it all fits together. 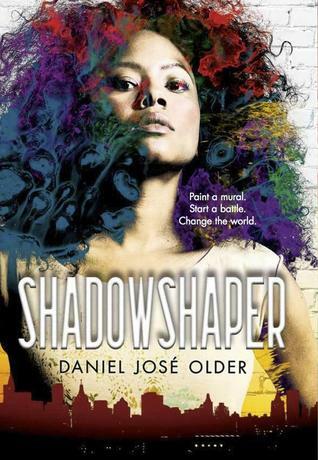 Come over to our Batty About Books Facebook page and tell us what you thought of the first half of Shadowshaper. What stood out for you? Maria has a fascinating look at the book through the windows and mirrors frame of diversity. Please stop by Maria's Melange and read her thoughts.